2014-03-15 - Updated to game version 1.67. This is kind of an experimental version. It may be a bit flaky with some of the newer rabbithole types, but it should work all in all. 2011-10-26 - Minor fixes to get rid of service hiccups. Or something. 2011-10-18 - Updated to game version 1.26. 2011-06-01 - Updated to game version 1.22/2.16/3.12/4.9/5.7/6.4/7.2/8.0. 2011-04-18 - Czech translation added. 2011-01-31 - Finally got around adding code to create new service sims if the existing ones are already up and running. Also streamlined the code, and removed obsolete parts. You know, for that warm and fuzzy feeling. 2010-11-18 - Fixed the meal quality for food coming from combo Rabbit Holes. Choked the empty button in the phone order menu in Bridgeport (don't know if the cause was Bridgeport or the combo Rabbit Holes, but something is definitely messed up there). Altered the price calculation to make more sense if you also use the Ingredient Overhaul Mod. Tell me if the latter one works for you. 2010-10-30 - Updated to work for LN combo Rabbitholes as source and LN apartment shell thingies as target. Fixed an issue that caused force-exit of all sims currently in the RabbitHole on end-of-service destruction of the delivery sim. 2010-10-27 - Updated to game version 1.17/2.12/3.8/4.5/5.2/6.0. Update is mandatory. 2010-09-07 - Updated version header to game version 1.15/2.10/3.6/4.3/5.0. No code changes were necessary. Also removed Swedish translation due to borkedness. 2010-08-15 - Order food interactions could not be queued. Fixed. However, the number of orders you can have at the same time depends on the number of available pizza service NPCs. The delivery sim will now properly disappear into the restaurant after the delivery instead of coming out again and then disappear. 2010-08-08 - German translation changed. 2010-08-07 - Changed one of the event listeners to notice it when you select a sim. If you start a new 'hood, the Order Food menu should now definitely be available on the cell phones at least if you change the active sim once. I didn't really want to do it that way, because it seems awfully aggressive for something like that, but there's no better way. The code in question is almost definitely so fast that you won't notice anything anyhow. 2010-08-05 - Changed the code, so the "call for meal" interaction will show up on ordered food too. As far as I am concerned this glitch was caused by an EAxian bug. That's my story and I'll stick to it. Added event listeners so new sims and phones will have the interaction too, without having to reload the game. 2010-07-31 - Updated Traditional Chinese translation. 2010-07-29 - Updated Portuguese translation. - Fixed a timing issue which would cause the engine to destroy the delivery sim thus causing the delivery to fail before it even started. - Added order food menu to all phones (credits to twallan from whom I stole a little code snippet to stop the pie menu from being squeezed into to the upper left corner). - Added different meal qualities to have an actual benefit from more expensive foods. - Tweaked prices and meal quality to be dependent on the cooking skill required to make the meal. Some meals are cheaper, some are more expensive. I don't want to hear any complains involving pink diamonds. These prices are absolutely reasonable in the price structure of the game (which itself is absolutely NOT reasonable). - Sorry, but I'm not going to make new screenshots. I hate that stuff. 2010-07-28 - Danish and Taiwanese translation added. 2010-07-25/3 - Portuguese translation added. 2010-07-25/2 - Polish translation added. Hopefully fixed all translations. 2010-07-25 - French translation updated. 2010-07-24/4 - Brazilian translation fixed. 2010-07-24/3 - Changed the crappy thumbnail. 2010-07-24/2 - Dutch translation added. 2010-07-24 - Swedish and Norwegian translation added. 2010-07-23/3 - Russian translation hopefully fixed. Brazilian translation added. 2010-07-23/3 - Russian translation added. 2010-07-23/2 - Spanish and Mexican translation added. 2010-07-23 - French translation added. Sometimes you just want a sim which cannot or does not cook. In that case you're forced to stick to canned soup and cereal or to have your sim eat at the bistro or diner all the time. Well, not anymore, because with this mod, your sims can buy prepared food at the diner and bistro or, for the extremely lazy ones, have it delivered and put into their fridge without moving a muscle. BTW: This is by no means a cheaty mod. If you think this mod would enable you to wriggle yourself out of the hassle of making Ambrosia ... think again. You can only buy meals which are made from freely available ingredients. Just put the mod into you mods folder. 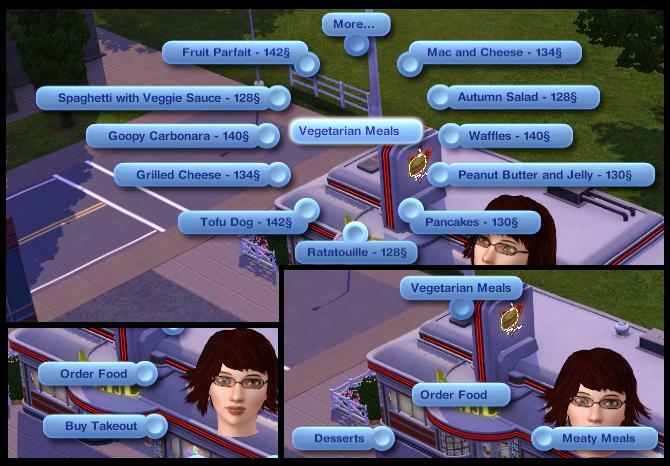 In the game two new menus will appear when you click on bistros and diners: "Buy Takeout" and "Order Food". The "Order Food" menu will also appear on all phones. Choose the type - meaty, vegetarian or dessert - and the specific meal. The prices depend heavily on the ingredient cost and the skill required to make the meal. Delivery expense for orders is 50§. You will get at least normal quality food at the diner and at least great quality food at the bistro. Accordingly, the prices are different for diners and bistros. Dependent on your choice, your sim will either go to the restaurant to get the food or the delivery sim will bring it to you and put it directly into your fridge. That is, most of the times. Sometimes, the delivery sim gets lost on the way. This mod is fully localizable. If you are willing to support a translation, please read the first comment for instructions. This is a scripting mod and as such the possibility for conflicts with other mods, no matter what kind, is next to non-existant. Heads Up! If you check this mod in Delphy's Dashboard, it may show a conflict with my other mods. You can ignore that. It's by design, i.e. some of my mods share one framework resource. It will actually conflict in the sense that the game will only load one instance of that resource. That's the whole point, though. Before you remove this mod, please make sure that no sim is currently on his way to get food and no order is currently being processed. If you don't do so, you may be become unable to load your savegame. Please respect that I support my mods but not mods or even custom content in general, not in my upload threads anyway and certainly not if you ask me by PM. I will always try to find and squish bugs, therefore I appreciate bug reports. If one of my mods isn't working for you, please at least try to ensure that it's a failure of my mod before you ask for help. You'll find the link to the detailed CC Basics tutorial when you click on the Install Instructions tab. I am a compassionate guy, but please understand that I can only muster so much endurance to address issues completely unrelated to my mods. Thanks to timoram26, Sims_MX, KuriXarya, Shykary, Padda1794, Henek, emilyjagt, des-demmonia, GTNS, gutchi1, TLSWarrior and Mar_ienka for translating. Might lead to a serious case of squished brain. Your game should be safe, though.